As mentioned there, this is inextricably linked in my mind with Westworld, dating from an era when popular genre cinema meant more than superheroes clobbering each other over the head with buildings. 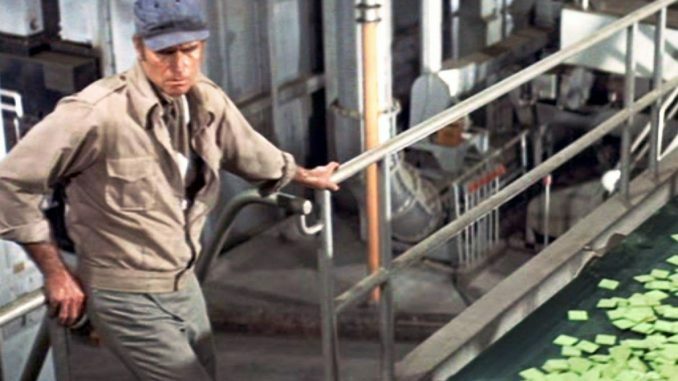 But I hadn’t actually seen Soylent Green, though was very much aware of the ending, with its famous revelation, that… Wait. Should I say more? Has the statute of limitations on spoilers expired? Or has it gone so far past, that the twist is now likely unknown again, to an audience largely born after its release? To be safe, I’ll err on the side of caution, even if the fourth entry when I Google the film’s title gives it away. It turns out to be somewhat related, yet also the complete opposite of Westworld: the shiny, slick future portrayed in the latter is replaced by one where New York City has a population of 40 million, people sleep anywhere they can find space, and the scarce food supply is largely made from plankton. In this setting, we find Detective Frank Thorn (Heston), a cop who shares a tiny apartment with analyst Sol Roth (Robinson, in his final role). Thorn is investigating the murder of Soylent executive William Simonson; initially looking like a botched robbery, the more Thorn looks, the more it appears to have been an assassination. Turns out Simonson had visited a Catholic priest just before his death; the priest won’t break the confessional vow, and turns up dead shortly after as well. The case is closed on orders from higher up – in line with Good Cop Rule #17, Thorn proceeds regardless. The setting offers a good lesson in the shifting time-frame of doom. The Harry Harrison story on which it was based, “Make Room, Make Room,” was written in 1966 and set in 1999. The film moves the setting forward to 2022, so we’re now little more than five years from that. The opening montage tells us many concerns of the time are still present: pollution, decimation of natural resources, global warming. Have things got better or worse in four decades? Hard to say, except in the area of over-crowding, where the world’s population has close to doubled since. Certainly, the future depicted bears little resemblance to contemporary life. The most obvious difference – both to reality and Westworld – is the almost complete absence of computers. The sole exception is an arcade machine in Simonson’s apartment: it was actually the first such built, playing Computer Space (a very primitive version of Asteroids). This is an issue, as its style feels less like the future than the distracting epitome of seventies chic, from curtains to plastic chairs. 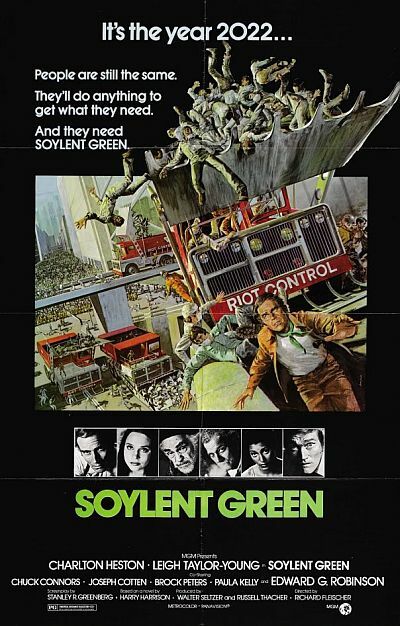 In terms of atmosphere, Soylent seems to have influenced Blade Runner, sharing a cynical, hard-bitten hero making his way through a murky, densely-packed urban landscape, sharply divided between the corporate haves and the have-nots. While a good role for Heston, it’s Robinson who steals the show, particularly with the final scene depicting his euthanasia, made all the more poignant by his actual death, less than two weeks after filming ended. But I must confess, knowing the ending robbed the film of much power, and I instead found myself having throughout to suppress an urge to yell its most famous line at the screen.